This project seeks to improve the literacy levels in Guyana and is in keeping with one of the areas of focus of Rotary International: “Education & Literacy”. More than 775 million people over the age of 15 are illiterate. That’s 17 percent of the adult population. The goal of Rotary International and by extension Rotary Clubs is to strengthen the capacity of communities to support basic education and literacy. Mark Wilson a member of Rotary said “When you teach somebody how to read, they have that for a lifetime. It ripples through the community, one by one” – it is with this in mind that the Rotary Club of Georgetown felt that this partnership was important, especially so to touch those out of town areas that are not served or underserved by ‘brick and Mortar’ library services. This project spanned over two and a half years and is meant to celebrate the Club’s milestone of our 60 years as a club serving communities in Guyana. 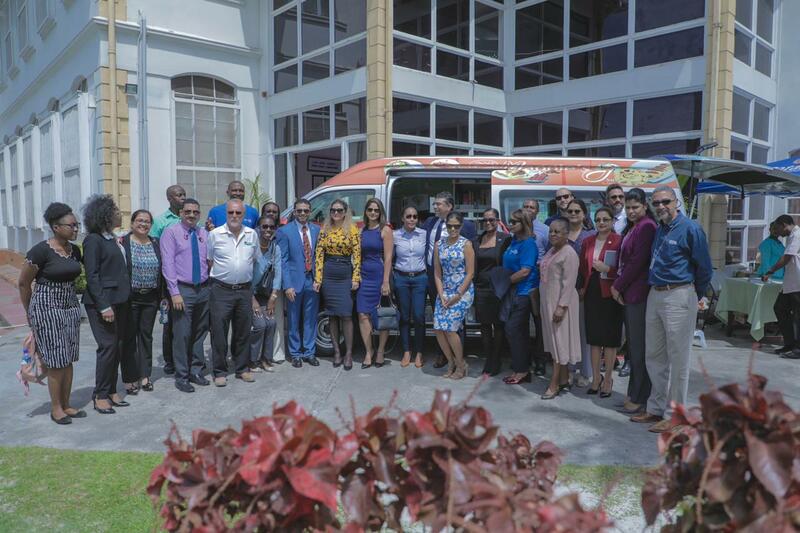 The project was done in 2 phases – in the first phase the Rotary Club of Georgetown ran a car raffle to start to garner funds – Rotarians spent hundreds of hours between Gift Land Mall and Courts Main Street seeking support from the public. The Club continued to raise funds through the various fund raising activities supported by friends of Rotary and so phase 2 commenced a year ago. This phase saw us acquiring the vehicle and outfitting it - More than 3,000 titles will be available on the Bookmobile. The plan is to visit over twelve locations each month with allowances for additional visits based upon request. This new bookmobile is expected to have mobile “hotspot” WiFi capability (this is still to be worked out), onboard laptops with external memory to enable students to access soft copies of research material and a wireless printer for users. Although all sectors of the population will be served, the focus will be on three major groups: nursery and primary schools in addition to outlying neighborhoods not located near a branch library or library center. - Graham Hall Primary, Better Hope Primary, Enmore Hope Primary, Mon Repos Primary, Chateau Margot Primary, Cummings Lodge Primary, La Bonne Intention Primary and St. Paul’s Primary and communities there. The following nursery schools will also be visited: Lusignan Nursery, Better Hope Nursery and West Road Nursery. The Rotary Club of Georgetown is indeed very pleased today to hand over this Bookmobile to the National Library and will continue to work with the Library in our quest to improve literacy levels in Guyana.